It seems we are heading into the chocolatey part of the year. The time of year when if you peruse supermarket aisles you might see a sea of mass produced, overly packaged chocolate all at really accessable prices. Now how do these chocolates manage to stay at these comfortable prices? Well, there is a good chance it will be made of compound chocolate- which means it could well have palm oil in it. Food miles are a given. And the work in order to harvest the cocoa? Well it wouldn’t be surprising if it was done under child labour conditions. So how do we not buy into that whole rather dirty circle? Well, simply put, don’t. Vote with your dollar. Buy fair trade and consider what you’re buying before you do so. What you are really buying into? Fair trade chocolate. Still just as important as last year. Tribes and Nations– stockists of Fair trade easter eggs. Chocolatier– does Fair trade options for Easter. 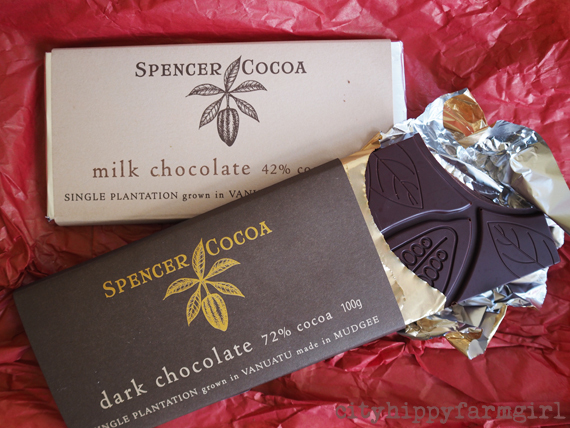 This entry was posted in Connecting with Community, Food Glorious Food and tagged chocolate, fair trade, spencer cocoa by cityhippyfarmgirl. Bookmark the permalink. Such an important post Brydie, thank you for reminding us. But yes, a big yes to the quality over quantity. Not cheap but the taste is….mmmm. So many different flavours in there rather than a generic chocolatey taste. An upvote for Spencer chocolate from me as well. Some of the best tasting chocolate I’ve eaten!! Beck thanks for the heads up on this company. I hadn’t heard of them before and definitely worth looking into! Hope the kiddo’s love the bunnies. Thanks for the timely post. Living simply in the city can sometimes be quite a challenge – but with options like these, the choice is there for us to make. Quality chocolate is important in life, as is the comfort of knowing that our little treats are not causing harm to earth or child. Thanks for sharing info and link to these brands. May Easter bring you all happy moments, time for reflection and peace.